Storage shed - Choosing the right plans - Build it Yourself! Choosing to build your own shed is a great idea. If you want a nice looking shed, choosing the right shed plans is very important. There are many wood storage shed kits you can buy, and they are very nice. You will still need to assemble these shed kits. A storage shed kit will cost you more than building your own storage shed. You can save about half the cost doing it yourself. If you don't want to spend to much on a shed, you should consider building one yourself. Building a shed is not difficult, you can take a look at my shed project to get an idea of what is involved. Choosing the right plans is crucial to make this project easier, and get better results. 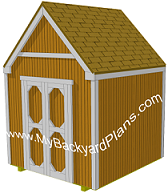 I have added a list of sites with free shed plans here on my site, below I have added storage shed plans to buy, it's a small investment to pay for a great shed. Storage shed project with material list/ cutting list and lots of pictures with instructions. If you are looking for a different style or size take a look at the shed plans below, they are not free, but it's a small price to pay to build a great looking shed. Here is a list of some of the most popular shed plans online. These shed plans are priced low and are available for instant download. Lots of different styles and sizes to choose from. Before you begin your shed project start with a good set of plans. Below are some of the most reputable sites to help you choose some plans. www.bighammersoftware.com. 16 fully-designed sheds Comprehensive plans, how-to guide, and a detailed shopping list. www.rockler.com Includes detailed step-by-step instructions, in-progress photos, exploded diagrams, complete materials list and cutting schedule. Ideal for woodworkers and DIY ers of all skill levels. Finished project measures 90" high x 48" wide x 24" deep.